This Illinois jurist and early colleague of Abraham Lincoln served as associate justice of the U.S. Supreme Court (1862-77) and as U.S. Senator from Illinois (1877-83); he acted as Lincoln's campaign manager at the Republican National Convention in 1860 and helped orchestrate his nomination to the presidency. Bold and handsome "David Davis / U.S. Senate / Bloomington / Illinois / July 1877" penned in brown ink on a heavy stock 4" X 2½" card. Very good. Tiny archivally-closed tear at center of bottom edge (slightly affecting the last "7" of the date). 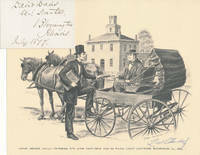 Accompanied by a fine and outstanding 8" X 10" black-and-white print of an ink-and-wash artist's rendering by the premiere Lincoln artist Lloyd Ostendorf, a charming scene showing Davis in horse-drawn carriage chatting with Lincoln in front of a large brick structure. Caption at bottom reads "Lawyer Abraham Lincoln Conferring With Judge David Davis Near the McLean County Courthouse, Bloomington, Ill. 1846." At lower right, Ostendorf signs this print boldly in blue ballpoint. This Dayton, Ohio commercial artist (1920-2000) became the foremost artist interpreter of Abraham Lincoln and his circle, illustrating every facet of Lincoln's life in various media over several decades; he authored and/or illustrated several Lincoln books, such as the 1963 classic "Lincoln in Photographs: An Album of Every Known Pose" (with Charles Hamilton). A superb Davis signature dated several months after he was sworn in as senator illustrated with a choice and appropriate image signed by its artist. The only "his 'n' hers historians" in the lengthy history of Lincoln historians, his scholarly and hers popular: He was an American historian and author ("Constitutional Problems Under Lincoln," "Lincoln the President") considered by many the greatest Lincoln scholar of the 20th century; she helped research some of his works and herself authored popular titles such as "Mary Lincoln: Biography of a Marriage" (1953), "Lincoln's Sons" (1956), "The Courtship of Mr. Lincoln" (1957), "I, Mary" (1959) and "Colonel Elmer Ellsworth" (1960). ALS, 1p, 8½" X 11", Urbana, IL, 12 July 1952. Addressed to Arnold Gates (1914-93, noted Lincoln and Civil War scholar). Very good. Faint original folds. Penned bold and large in blue fountain pen ink, in this cordial note James G. Randall tells the budding Lincolnist, "I greatly appreciate your friendly note of recent date. Please accept, as my gift, the copy of 'Living with Lincoln' which is being mailed to you separately. 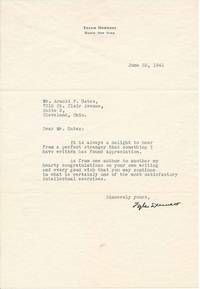 It is heartening to have your words of approval bearing upon my published work...." Second, another ALS, 2pp (recto and verso), 6¼" X 8½", Urbana,, IL, 5 November 1958. Same recipient. Near fine. Also penned in handsome blue fountain pen ink, Ruth Randall thanks Gates for "asking me to review a book your section in Lincoln Herald" but declines -- "I am swamped with work at present and my strength is limited...." I am working on a book about Colonel Elmer E. Ellsworth with special emphasis on his relation to Lincoln, and because of the approaching centennial of the Civil War it is desirable for me to finish it as soon as I can. I am also expecting galley proofs of my biography of Mary Lincoln for teen-age girls. The title is I Mary from the marriage service 'I Mary take thee Abraham to my wedded husband.'" A superb and uncommon pair. This American historian and academic eon the 1934 Pulitzer Prize for his "John Hay: From Poetry to Politics"; he also edited the 1939 "Lincoln and the Civil War in the Diaries and Letters of John Hay." TNS, 1p, 7¼" X 10½", Hague, NY, 23 June 1941. Addressed to Arnold F. Gates (1914-93, noted Lincoln and Civil War scholar). Near fine. "It is always a delight to hear from a perfect stranger," he writes, "that something I have written has found appreciation." He also sends congratulations for something that Gates sent him -- he was publishing Lincoln essays in booklet form -- with "every good wish that you may continue in what is certainly one of the most satisfactory intellectual exercises." Boldly signed in black ink. This Swiss-German author's biographies were widely popular in many languages -- among them are Lincoln, Napoleon, Jesus, Bismarck and Goethe. On the message side of a glossy 5¼" X 3¼" heavy stock photograph of Ludwig writing at a desk, he boldly pencils: "Thanking for / kind wishes. / Ludwig / Lucerne / 3.3.40 / Greatings [sic] to your / splendid [ ? ]." Address portion at right also in his hand to Arnold F. Gates of Eleveland, Ohio (1914-09, a future noted Lincoln scholar). Very good. Later this same year Ludwig emigrated to the United States. Surely Ludwig's biography of Lincoln was the occasion for this Lincoln scholar to write the great Lincoln biographer. This Springfield attorney clerked under Lincoln at the Lincoln & Herndon law offices (1856-61), though after fighting in the Civil War he worked in banking, investing and farming; he is well known for his popular 1916 account "Personal Recollections of Abraham Lincoln" and his 1924 "Intimate Character Sketches of Abraham Lincoln." ALS, 1p, 6¼" X 7¼", Springfield, IL, 1922 August 18. 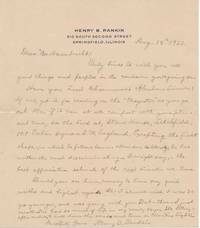 Addressed to George P. Hambrecht (1871-1943), noted education official, Lincoln scholar and founder of the Lincoln Fellowship of Wisconsin (which still exists today!). Near fine. On his imprinted letterhead, Rankin sends Hambrecht a cordial letter of advice and encouragement to this Lincoln buff about to tour England: "Only lines to wish you all good things and peoples in the mission you'r going on. Have you Lord Charnwood's Abraham Lincoln? If not, get it for reading on the 'Magestic' as you go out. Then if it can at all comport with your plans and time, see the Lord at, Stowe House, Litchfield, 108 Eaton Square S.W. England. Excepting the first 5 chaps. (in which he follows Lamon & Herndon too literally) he has written the most discriminating -- I might say, -- the best appreciative estimate of the real Lincoln we have. Should you see him, convey to him my good wishes and highest regards. Ah! I almost wish I was 30 yrs. younger, and was going with you. But -- then -- I just recall -- I've had so much of life in my nearly 86 years. 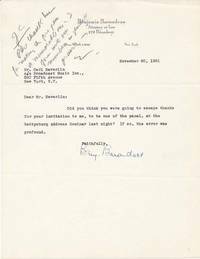 It's better, -- after awhile, to pull down the shades and turn on Eternities Lights...." With original imprinted envelope (addressed to Hambrecht in another hand) and 8½" X 11" onionskin carbon copy of Hambrecht's transcription of this letter. A delightful Lincoln content piece from one in his immediate circle. Abraham Lincoln's great-grandson and Robert Todd Lincoln's grandson, second child of Robert's daughter Jessie Lincoln Beckwith (1875-1948); wealthy and reclusive, R.T.L. Beckwith shunned publicity and the spotlight and died without issue -- making him the last living direct Lincoln descendant at the time of his death. Signed envelope, 8 3/4" X 4", Manchester, VT, n.d. [faint postal cancellation 1972 October 2]. Near fine. At upper left corner of this heavy stock orange/brownish envelope, Beckwith boldly prints "R.T.L. Beckwith / Hildene / Manchester / Vt." in black fineline, and in the recipient address area at center writes in cursive "Mr. and Mrs. Ralph Newman / The Abraham Lincoln Book Shop / Chicago / Ill." Alongside this, in another hand (presumably a postal employee), "18 E. Chestnut" has been lightly pencilled. Ralph G. Newman (1912-2000) was the founder of the noted Abraham Lincoln Book Shop and in the 1970s became one of the few people in the Lincoln world that Beckwith took a shine to and to whom he would sell artifacts handed down in the family from Abraham, Mary and Robert Lincoln. Beckwith's autograph is quite scarce in any form. Beckwith lived in Virginia for much of his life, so why he would be writing Newman from the estate of his grandfather in Vermont is an intriguing mystery. Inside this envelope are two original 4½" X 3½" color photographs --- almost certainly unpublished. These informal snapshots (both blank on verso) are both pristine and unfaded. The first depicts Beckwith in think sweater and knit cap splitting logs (what else?) in a wooded backyard, looking up at the camera. The second was apparently taken in the attic of Beckwith's home and depicts two short barrister bookcases filled with hardbound books, an oil painting of what appears to be Robert E. Lee in later years leaning against one wall, an old trunk labeled "R.T.L.B" in the foreground amidst typical attic clutter (vase, lightbulb boxes, etc.) Also present is a pristine blank sheet of Beckwith's imprinted 8½" X 11" letterhead stationery from his home "Woodstock on the Piankatank" in Hartfield, Virginia. A delightfully unusual and extremely scarce grouping. In Lincolniana circles, the famed director of the Department of Lincolniana at Lincoln Memorial University in Harrogate, Tennessee, and author of numerous Lincoln studies. TLS, 1p, 8½" X 11", Fort Wayne, IN, 1959 March p. Addressed to noted Lincoln and Civil War scholar Arnold F. Gates (1914-93). Near fine. 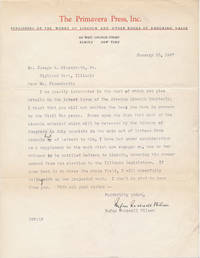 On letterhead of "The Lincoln National Life Foundation," which cites him as director, McMurtry discusses a Lincoln p.r. event coming up in that centennial era: "I was delighted to receive in yesterday's mail the Broadcast Music Incorporated's folder of the first seven broadcasts which they are featuring this Lincoln sesquicentennial year...." Goes on about various Lincoln matters and signs off simply "Gerald" in black ink. Accompanied by one of these later BMI broadcasts authored by himself, "The World of Tom and Nancy Lincoln," a 6-page 8½" X 11" radio broadcast script published by music licensing giant Broadcast Music Inc. later this same year. (Their founder and president, Carl Haverlin, was a close friend of McMurtry and Gates and himself a serious Lincoln buff.) Stapled at upper left, as issued. Fine. This prominent New York attorney was a noted Lincoln scholar, author of the 1954 "Three Lincoln Masterpieces"; charter member and vice president of the noted Civil War Round Table of New York and namesake of the prestigious Benjamin Barondess Award for new Civil War titles. TLS, 1p, 8½" X 11", New York, NY, 1958 May 5. Addressed to Arnold Gates (1914-93), noted Lincoln/Civil War scholar and fellow officer of the New York Civil War Round Table. Near fine. Superb content thanking Gates for the journal he put together for their Round Table -- in part: "I could not put it down until it was completely read, chewed and digested... it is a tremendous tour de force you have done. The labor must have been vast. The coverage is simply encyclopedic..... where do you get the time to be a one-armed paper-hanger, a cashier, a recorder, a secretary, and pater familias?" Goes on at length along these lines. Signed simply "Ben." Accompanied by an un-issued "Benjamin Barondess Award," faux parchment 11" X 8½". Fine. Printed "For an outstanding contribution to the field of Lincolniana" award established by the Round Table he served so well in the year of his death. 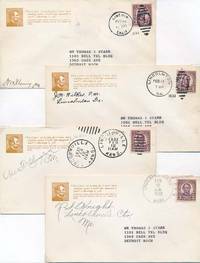 Group of 6 unusual postal covers created by Lincoln scholar Thomas I. Starr (1903-65), noted Lincoln scholar from Detroit, Michigan, whose publications include "Lincoln Belonged to a Great Fraternity" (1936), "A Lost Speech of Abraham Lincoln" (1936) and "Lincoln's Kalamazoo Address Against Extending Slavery" (1941). Six identical 6½" X 3½" envelopes, each bearing the then-new 3-cent Lincoln stamp at upper right and, at upper left printed in brown ink, a profile portrait of Lincoln alongside the tiny printed text quoting Lincoln's well-known reply when told that a new city in Logan County, Illinois was to be named after him ("You'd better not do that, for I never knew anything named Lincoln that amounted to much."). Starr typed his Detroit name/address at lower center and mailed these to cities across the country with the word "Lincoln" in them, having them cancelled on Lincoln's birthday (12 February) 1933 and signed by the postmaster of those cities. Thus the envelope cancelled in Lincoln, California has "K.M. Fleming p.m." penned at lower left, the envelope cancelled in Lincolnton, Georgia has "J.M. Wilkes, P.M. / Lincolnton, Ga." penned at upper left, the envelope cancelled in Lincolnville, Kansas has "Axel F. [illegible] / P.M." penned at upper left, the envelope cancelled in Lincolnville Center, Maine has "R.S. Knight / Lincolnville Ctr. / Me." penned at upper left, the envelope cancelled in Lincolnton, North Carolina has "Giles B. Goodson / Postmaster / Lincolnton NC" penned at upper left, and the envelope cancelled in Lincoln, Arkansas has "H.T. Sluth P.M." penned at upper right. A fun, odd group. This Springfield attorney clerked under Lincoln and is well known for his popular 1916 account, "Personal Recollections of Abraham Lincoln." Partly-Printed DS, 1p, 8¼" X 4", Petersburg, IL, 1889 July 31. Very good. Routine and unnoticeable cancellation slashes. Handsome printed check drawn on the First National Bank, with a nice engraved vignette of that institution at left. Filled out and signed by cashier James M. Robbins to Rankin in the amount of $500.00. Rankin signs boldly in full on the verso, and above his endorsement also pens "Pay order Mrs. Mary A. Witwer." Two purple inkstamped bank seals also on verso, not affecting signature. Intriguing check for what was at that time a considerable sum. Noted Abraham Lincoln authority remembered for titles such as "Lincoln in Caricature," "Lincoln Among His Friends," "What Lincoln Read" and "Uncollected Works of Abraham Lincoln." Good content TLS, 1p, 8½" X 11", Elmira, NY, 1947 January 10. Addressed to Joseph L. Eisendrath Jr., a noted Lincoln and Civil War collector from Illinois and one of the founders of the Chicago Civil War Round Table. On letterhead of The Primavera Press. Nice Lincoln contents, reading in part: "I am greatly interested in the work of which you give details in the latest issue of The Abraham Lincoln Quarterly. I trust that you will not confine the book you have in process to the Civil War years. Based upon the fact that most of the Lincoln material which will be released by the Library of Congress in July consists in the main not of letters from Lincoln but of letters to him, I have had under consideration as a supplement to the work which now engages me, one or two volumes to be entitled Letters to Lincoln, covering his career onward from his election to the Illinois Legislature. If your book is to cover the whole field, I will cheerfuly relinquish my own projected work...." Bold, full signature and a couple of inked text corrections.With original envelope, addressed in Wilson's hand. A carbon copy of Eisendrath's January 14th response in included. Accompanied by a superb printed 5½" X 6" profile photograph of Wilson and an 8pp 8vo printed prospectus for Wilson's edition of "The Works of Abraham Lincoln" (Caldwell, ID: The Caxton Printers, 1941). Interestingly, neither Wilson nor Eisendrath ever published these projected works! Chicago philanthropist and renowned Lincoln collector whose 7000 item Lincoln collection became one of the cornerstones of the Library of Congress's Lincoln collection. ALS, 1p, 6" X 7", Chicago, IL, 1946 September 5. Addressed to Edward Jacobs. Fine. Thanks the Peoria Lincoln publisher for "the beautiful and well designed New Salem item.... I shall, with pleasure, add it to my Lincoln collection." Comes with a copy of Elmer Gertz's February 1942 "Lincoln Herald" article, "The Library of Alfred W. Stern." Popular New Hampshire governor (1935-37) and senator (1937-54). TNS, 1p, 8" X 10½", Washington, DC, 1940 May 28. 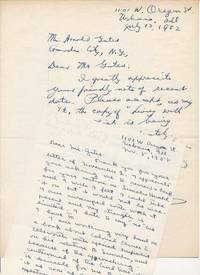 Addressed to noted Lincoln/Civil War scholar Arnold F. Gates (1912-93). Fine. On "United States Senate" letterhead, the Senator fulfills a Lincoln buff's request: "I am glad to send you a copy of my address of February 12, 1940, but regret that no copies of my May 22nd speech are available...." Boldly signed in blue ink. Accompanied by the aforementioned speech, an offprint of the New Hampshire senator's "Congressional Record" speech, 2pp (both sides), 8½" X 11", delivered in Albuquerque on February 14, 1940, boldly signed at upper left of the first page in blue ink. One of the "Long Nine," nickname for the group of nine state legislators elected to the Illinois legislature in 1836 to represent Sangamon County, so-called because all were at least six feet in height; one of Lincoln's fellow representatives among them was Elkin. Partly-printed ADS, 2pp, 7½" X 12½", Springfield, IL, 1841 October 28. Good to fair. Some separations at folds and some archival tape repairs, but overall sound and attractive. 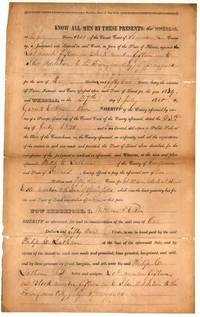 Land deed from a sheriff's sale in which a parcel of land was purchased by a Philip C. Latham for the amount of taxes owed on it ($1.51). Signed by Elkin as sheriff at the close and also twice within the text. Interestingly, the parcel of land was "in E[lijah] Iles Addition to the Town (now City) of Springfield" -- Iles being the captain in the Black Hawk War to whose mounted company Lincoln was assigned when he briefly re-enlisted. This company was part of a "spy battalion" that was dispatched to Galena to rescue the trapped residents from Black Hawk. An unusual piece with nice associations. The penultimate last living Abraham Lincoln descendant was this great-granddaughter of President Lincoln, the daughter of Robert Todd Lincoln's daughter Jessie; she was an amateur artist and a recluse who rarely strayed out in public. Partly-printed ADS, 1p, 2¼" X 2 3/4", Manchester Center, Vermont, 1936 January 15. Near fine. Personal check printed on a pale orange background and drawn on The Factory Point National Bank (where her parents and grandparents also banked for many years), filled out entirely in her hand in blue fountain pen for $545.00, made out to the Factory Point National Bank and signed large and bold at lower right. Usual cancellation perforations, not affecting handwriting. Mary Beckwith autograph material is quite scarce in any form whatsoever. First professor of fine arts at the University of Michigan. ANS, 1p, 9" X 11¼", n.p., 1867 December 22. Addressed to "Dear Sister." Good. Some age toning and mildly soiled; professionally silked. Brief, poignant note transmitting a portrait of Lincoln (not present): "As Christmas this year finds me in poor health, with very little money, not wishing to forget you and Father, I send you my favorite painting of President Lincoln. Wishing you both a merry Xmas and a happy New Year...." Accompanied by a TNS from RANDOLPH G. ADAMS, legendary director of the William L. Clements Library at the University of Michigan, 1p, 8½" X 11", Ann Arbor, MI, 1946 November 9. Addressed to John D. Denison, Jr. Good plus. "I have compared the signature on the Bradich portrait of Lincoln with other Bradish portrait signatures at the University and there is no doubt that these signatures are the same...." The portrait sent by the artist via this letter is NOT present. American historian, director the Louis A. Warren Lincoln Library and Museum from 1956 to 1973 and author of more than 200 articles, pamphlets and books about Lincoln. ALS, 3pp (separate leaves), 8½" X 11", Lincoln Memorial University letterhead, Harrogate, TN, 1941 July 11. Addressed to noted Lincoln scholar ARNOLD F. GATES (1914-93). Near fine. McMurtry replies graciously to some huge research questions the young scholar must have posed. In part: "...your questions will be rather difficult to answer off hand. The questions to be properly answered would require weeks of research work.... I would advise you to get a good history of Ohio, Nicolay & Hay's 'Complete Works of Abraham Lincoln' and Daniel J. Ryan's 'Lincoln and Ohio' from the public library in Cleveland... In these books you will find most of the answers to your questions.... I will be glad to help you on any technical questions that may confront you in your research work on Nancy Hanks...." Accompanied by a fine modern 8½" X 11" reproduction of a line drawing head-and-shoulders portrait of McMurtry. This prominent New York attorney was a noted Lincoln scholar, author of the 1954 "Three Lincoln Masterpieces"; charter member and vice president of the noted Civil War Round Table of New York and namesake of the prestigious Benjamin Barondess Award for new Civil War titles. TNS, 1p, 8½" X 11", New York, NY, 1951 November 20. Addressed to CARL HAVERLIN (1899-1985), noted Lincoln and Civil War scholar, radio pioneer and president of Broadcast Music, Inc. (BMI). Near fine. Referencing a Civil War Round Table event of the previous day, Barondess jokes, "Did you think you were going to escape thanks for your invitation to me, to be one of the panel, at the Gettysburg Address Seminar last night? If so, the error was profound." Boldly signed. Haverlin has scrawled the draft of a brief reply in bold pencil at upper left, as was his custom. Accompanied by a carbon copy typescript of the very talk Barondess had given at that seminar, 10pp (rectos only), 8½" X 11", n.p., 1951 November 19. Very good. Titled simply "BENJAMIN BARONDESS'S TALK," this double-spaced typescript on thin onion skin paper presents his overview of Lincoln's speech, its preparation and reception. The following year, an article by Barondess titled "The Gettysburg Address: Revealing facts about one of the 'Supreme Masterpieces of the English language'" was published in the Spring 1952 issue of "Autograph Collectors' Journal," and this is presumably the precursor of that article. An interesting and unusual pair for the Lincoln specialist. From the collection of noted Lincoln/Civil War scholar ARNOLD F. GATES (1914-93). This Republican served New Hampshire as governor (1929-31), representative (1933-39) and senator (1939-53). TDS, 3pp (rectos only), 8" X 10", n.p., n.y. . Fine. Original typescript of a radio address by this New Hampshire congressman, titled "Lincoln being dead yet speaketh," boldly signed and dated at the conclusion. Several pencil corrections in his hand. Also, a TLS from him, 1p, 8½" X 11", Washington, D.C., 1938 February 18. Transmits this speech to noted Lincoln and Civil War scholar Arnold F. Gates (1914-93). American historian and author ("Constitutional Problems Under Lincoln," "Lincoln the President") considered by many the greatest Lincoln scholar of the 20th century. ALS, 1p, 8½" X 11", Urbana, IL, n.d. Fine. Titled "Memo," a list of several Civil War books to be sent him, no doubt for research on one of his books; cancels previous Lincoln book ordered. Pencilled notations in another hand.